What can I get for Christmas? How many times do we hear this question whether directed to us or we’re asking the loved ones around us! What gift can I get to send my family down South/ Up North ? With courier costs, and postage costs adding to the cost of the gift, many of us consider this dilemma when buying for family near and far. As the children grow older and earning their own money, where do you draw the line with extended family? The days of buying ‘tat’ to fill up a sack and the economic squeeze the country has felt, has ensured that families now spend more money on experiences, treats and foods, and bespoke gifts rather then speculative gifts. People do want to support local businesses wherever possible, but just feel that time runs away from them, and the chance to support local businesses by rushing around the High Street versus using a computer/ phone and arranging online can clearly see why online retailers have the edge. Are you feeling the Christmas Sprirt? Nothing gets you more in the spirit than choosing your Christmas Tree here's some great tips from Better Homes and Gardens, listening to carol singers on the street corner , the twinkling of lights along the roads, the festive decorations adorning many high street shops. Our High Streets are coming alive at this time of year, and they need your support now more than ever! In the UK Small Business Saturday always take place on the 1st Saturday of December looking for a gift and want to know who you can support take a look here for a list of local suppliers . But we're an online retailer so why do we say this? Because.....we really DO support local businesses across the UK, many of our bakers have local cake shops, you can order online but our local cake shop or professional cake maker in the area will deliver it by hand. Many of our bakers WILL move into shops and have the desire to open their own cake shop, coffee shop, cake decorating classes etc. and therefore we want to support them in their quests to expand. Our bakers support other local business with many buying from their local farmers markets, local producers and local suppliers. 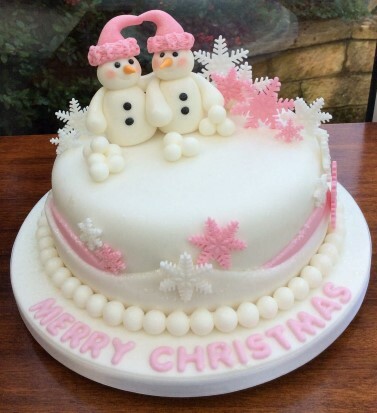 So what do you arrange for families far away ( but living in the UK), we have some great gift ideas from bakers across the UK, from cookies to cupcakes, from reindeer cakes to Fruit cakes our bakers are taking orders now. We do have bakers closing their order books for Christmas treats as they are fully booked- so do order now and let us take the worry out of whether your gift will arrive. All cakes are delivered with a message card and ingredients list, all are delivered by hand from the baker who made it. Our bakers love delivering these special gifts, and seeing the sheer joy on the recipient faces! Our bakers are local to your recipient so deliver with a cheery smile! Looking for something to do with the children, why not arrange to have some cookies decorated, whether as gifts for family or just a tasty treat for you all to enjoy- we loved this step by step tutorial .